With the clarity and verve for which he is famed, Niall Ferguson explains why the origins of the French Revolution lie in a stock-market bubble caused by a convicted Scots murderer. He shows how financial failure turned Argentina from the world's sixth richest country into an inflation-ridden basket case – and how a financial revolution is propelling the world's most populous country from poverty to power in a single generation. Now I've found another such back-story to add to Ferguson's 400-page discussion: The Ayr Crisis of 1772 in Scotland contributed to the American Revolution, a often-neglected back-story to rising up against the British empire and the Boston Tea Party. It sounds quite far-fetched and like an obvious example of economism (or "economic imperialism..."), so do hear me out. The idea was somewhat randomly brought to me by a review on the U.S. Economic History Association's website: well-known economic historian Hugh Rockoff of Rutgers University reviewed a recently-published book by Tyler Goodspeed with the snappy title Legislating Instability: Adam Smith, Free Banking and the Financial Crisis of 1772. 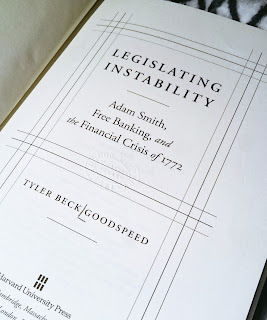 Rather than Rockoff's pretty ordinary review, the topic Banking regulations-Adam Smith-Free Banking was still a major a selling point for me. Off I went and made Uni of Glasgow library get it for me. The financial strains generated by the crisis of 1772 thus ignited intense antipathy, long latent, between Virginian and Marylander debtors and their Scottish creditors. As Scottish factors pursued debt claims through the colonial courts, they were often met with intimidation or outright civil disobedience. Goodspeed lists pages with examples from Maddison and Jefferson to many less-known characters who all refused to pay their debts to Scottish creditors (around the time of his death, Jefferson still owed the equivalent of a million dollars in 2013 prices to a Glaswegian creditor); accusations that Scots "bread up under strange feudal tennets", don't understand liberty; American rebel forces boasting that they owed more than they were worth to Scottish creditors, a debt they intended to discharge "with the broad brush, meaning the destroying of the books and papers of the merchants." (pp. 15-19). In a way, the discussion is brief, somewhat circumstancial, and not Goodspeed's main argument, but the suggestion is hardly unfeasible. Apparently, the argument is not even novel in the economic history literature; in his endnotes, Goodspeed's citations in support of the argument are well substantiated: Soltow (1959); Sheridan (1960); Gipson (1961); Devine (1973; 1974; 1976) and a quick google venture give me even more readings on the topic. As Ross Roberts recently discussed on the Economic Rockstar podcast (whose creator and, Frank Conway, will be at Glasgow Economic Forum! ): economic reasoning is a powerful tool for understanding human interaction and relations; it goes way beyond analysis of stock markets or interest rates, and it can help us to get the most out of our lives. Same goes for historical analysis: applying economic reasoning, even as a context, can improve the viability and applicability of historical research. That's not "economic imperialism" or "dismal science", it's taking advantage of the powerful tools at our disposal.